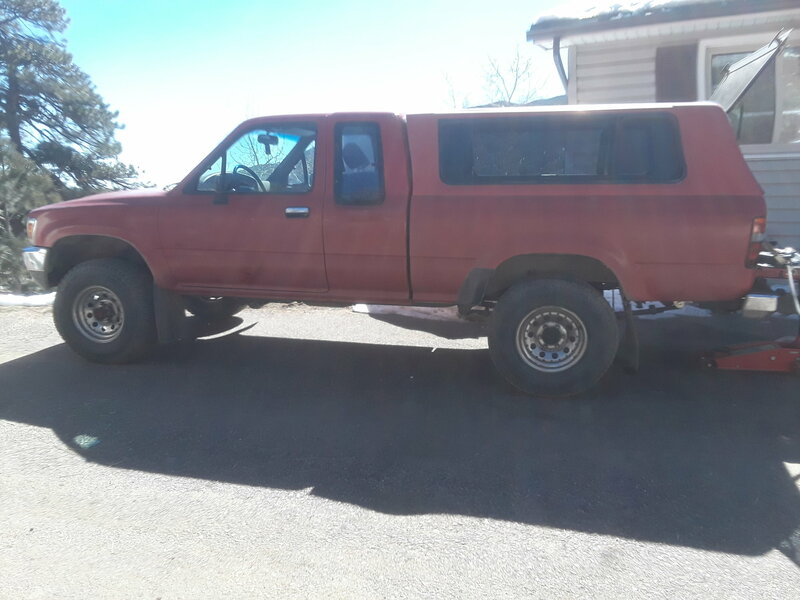 So over the past few months I have been doing a complete refresh on my 90 Pickup 4x4. This included a full steering overhaul ( pump, gear, lines and all linkages), full suspension (all bushings, shocks, rear springs) and other odds and ends. This was the biggest undertaking I have ever done with a vehicle and I used the factory service manual along the way. Now that its finally all back together and I have been able to drive it the past few days I have noticed some small issues that I can't seem to figure out and was hoping for a little insight. 1. I swapped in a SR5 gauge and noticed that the speedo likes sticking randomly. Sometimes it will work perfectly. Other times I'll slow to a stop and the needle will stay between 20-30 and won't move again till I get faster than what it was stuck at and then it will jump to whatever speed I'm at. Sometimes it will just randomly stick at whatever speed I'm cruising at and if I accelerate it will take it a few seconds to realize I'm going faster and then it will jump to that speed. I put in a new cable less than 2000 miles ago so I wouldn't think it would have anything to do with that. I just got back from picking my boys up from school and this is how it stuck when I turned the engine off. 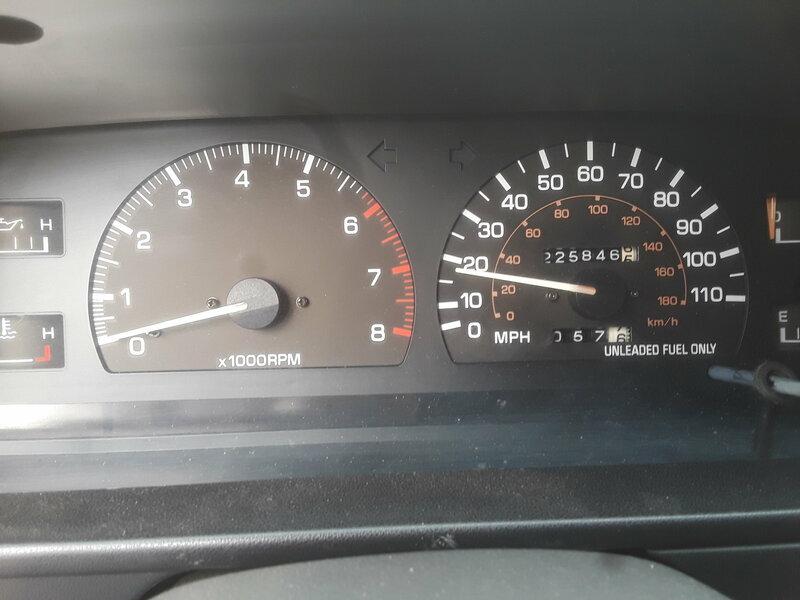 And for my own peace of mind, the gauge came out of a 92 4runner with the same engine, just a auto transmission and just wanted to confirm that the check engine and all dummy lights will work? 2. The steering pump is whining. I flushed the entire system and didn't attach the return hose to the resivior till almost a full quart had been through everything. I then started the engine and bleed the system by slowly turning the wheel back and forth. I checked the belt tension and alignment and the fluid level and it all looks good. The whining is noticeable when the motor is cold if you paying attention to it, but is really noticeable when it's hot. What else could/should I do here? 3. Lastly (for now) according to the PO he put the topper on it in 1990 and it was never taken off. I figured that's why the original springs had 0 life left in them and were completely flat. So I put in new OEM spec springs, Racho shocks designed for 0-1 inches of lift and 1" longer shackles from trail gear. Everything looked pretty good as soon as I took it off the stands, but now that I have driven it the past few days it has settled to basically where I started ( within 1/2 inch). The springs are completely level and there is little to no "spring" when weight is applied to the bed. I also have yet to reinstall the spare tire as it too was original and very dry-rotted. I was hoping the new springs and slightly longer shackles would actually given me a little rake. 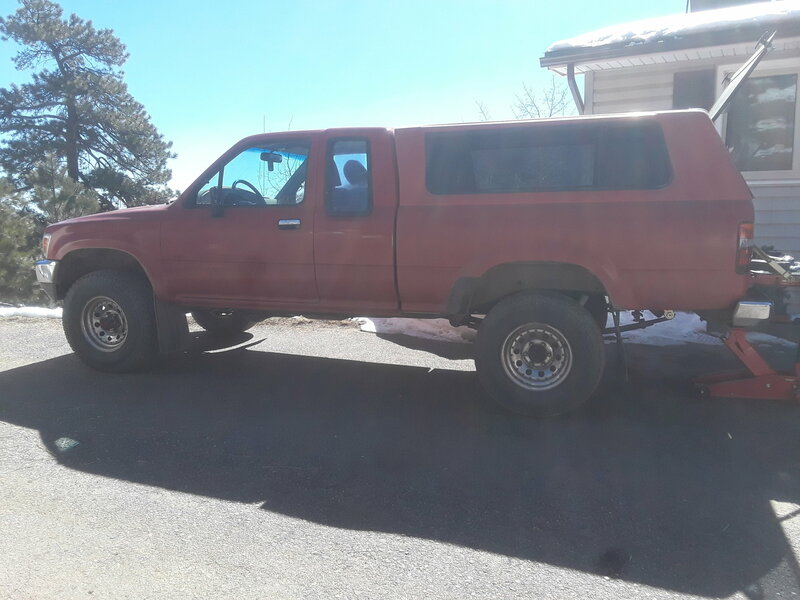 Do I need spring helpers or an aal to help compensate for the topper? I really prefer not to loose the topper at this time, so please don't offer that suggestion. Here it is at current ride height. Last edited by Robes; 03-21-2019 at 02:44 PM. You need more spring rate to compensate for the load. I THINK the longer shackle let's the springs flaten more. 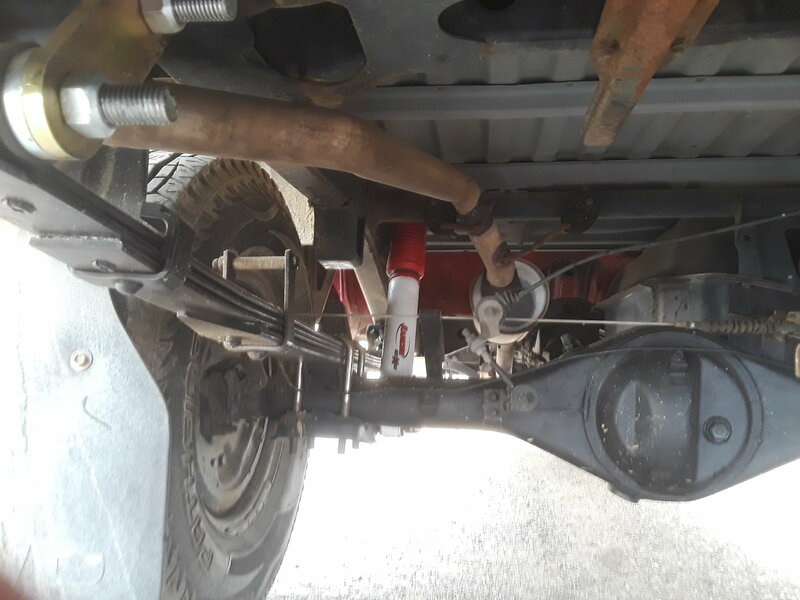 I'm not a suspension expert, but my geometry says they can now move the rear attachment farther back which makes them flatter, you did however pick up more droop. Make sure you are using the right fluid for you pump, the Toyota pump runs on ATF fluid not PS. You need to burn/bleed the system with the engine off and the wheels off the ground by turning back and forth between the steering stops untill you're not getting bubbles. As for the speedo, you for a bad one you can try to clean relube and inspect it for a bend needle or shaft. If it was a cable issue you would hear it skipping usually. For the PS stuff I am using Valvoline Import ATF. Which says it works with Toyota's. Does the reservoir have a filter/diffuser in it? In doing some other research it looks like other Toyota's do have one and that if its clogged it would cause whining because the pump is having to work harder. I cleaned the reservoir the best I could, but did not take it apart. 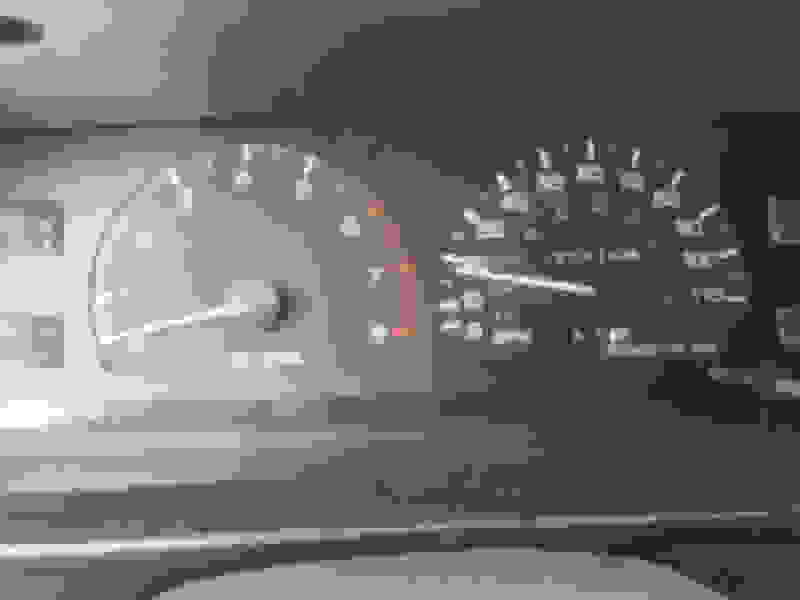 There is a very good thread on taking a gauge cluster apart and swapping parts. I will pass it on if i can find it. My 90 SR5 also makes noise and bounces. Here is that thread. It is a good one. SR5 Gauge Cluster Swap - How-to, with pics! Hmmm, looks like I'll have to take it back apart and check the spring. TOYOTA TECH OR OBDll GURU'S ? Help me toyota paint guru's ! Questions For The Paint Guru's! PC Guru's I need you!